Yellow jackets are a sub species of wasps and can be easily identified by their strong yellow tinge. The bald faced hornets, though only by name are hornets, are actually yellow jackets that are colored black and white. 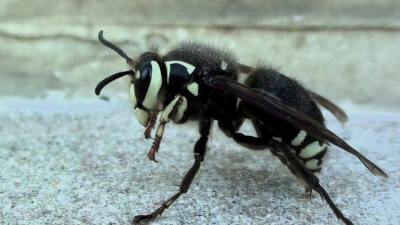 Their black and white coloring resembles a hornet whereas their ody anatomy is that of the yellow jackets. Yellow jackets and bald faced hornets belong to the vespula genus, are shiny and without body hair. Both these specimens are leaner than the bees and are capable of singing their victims multiple times. They have reputation for painful stings that can turn fatal in some cases. Bald faced hornets and yellow jackets are scavengers and hence are treated as beneficial insects as they help in reducing infestation of garden and agricultural pests to a large extent. Both these creatures are social wasps that live in colonies that comprises of a single reproductive queen, infertile female offspring that grow up to become workers and male drones whose sole purpose is to mate. They are both aggressive by nature and are capable of chasing down victims and attacking them fiercely if they feel threatened. Bald faced hornets are prominently black with white colored marks on their face and head and thorax. Yellow jackets as the name suggests are bright yellow in color with black stripes on their body. Most yellow jackets with the exception of the aerial yellow jacket, build their nests on the ground in abandoned animal borrows, sidewalks, hollows and cervices. The bald faced hornet builds papery nests on tall structures preferably trees and human construction sites. The nest of bald faced hornets also comprises of chewed up wood that is embedded with leaves and twigs whereas yellow jackets build with chewed up wood alone. Bald head hornets offer a reduced sting hazard to humans as they build their nests in high places while the yellow jackets post a serious threat as they are found either nearby or on the ground. Bald faced hornets are mostly predators than scavengers whereas the yellow jackets are the other way around.